The Mediterranean diet hit its stride in the early 1990s when celebrities and pundits started extolling the virtues of salads with cheese and olive oil, grilled meats basted with olive oil, and marinades with lemon pepper, garlic, and (you guessed it), olive oil. It was a rejection of dishes heavy with butter and cream, and a revelation to some who embraced the simple, bracing flavors along with the health benefits. The joys of this kind of dining were old news to Greeks, who had been cooking that way for centuries, and to patrons of Old Venice, a Manhattan Avenue mainstay that served Greek food since they opened in 1984. 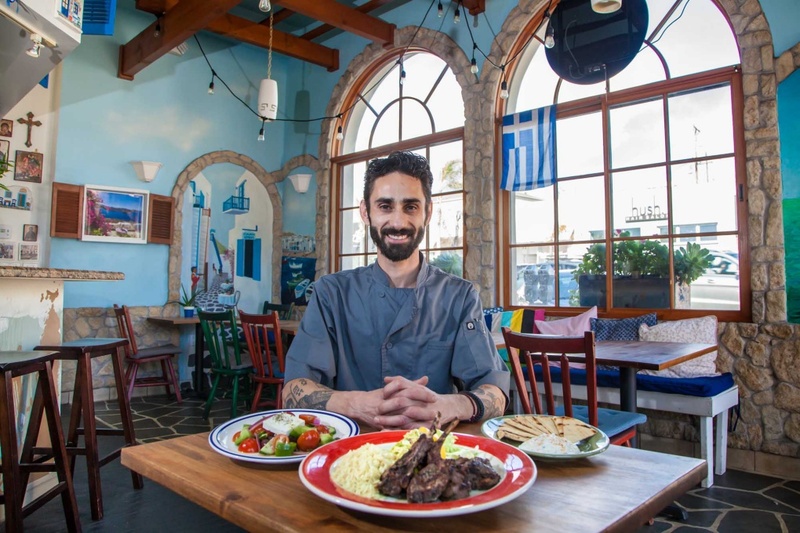 Founder Jimmy Hantzarides started the place with a menu that was more Italian than Greek and gradually added specials named after regulars so that it had an eclectic menu. The place closed after a fire in 2006 and Jimmy died in a bicycle accident during reconstruction, but his family reopened it and renamed it Jimmy’s Kouzina in his honor. That doesn’t mean the place has stayed exactly as he left it. In the last few years Jimmy’s menu has become noticeably more Greek, both in the food and wine selection. It’s a smart move, because the new identity helps them stand out in an area with many Italian and Mediterranean fusion restaurants. The casual restaurant has big windows to let in the sun and is decorated with photos and murals of Greek villages, which set the mood without going completely into kitsch territory. They don’t seem to play Greek music often, and on the last few visits the music was light classical at moderate volume. The TV’s often are playing the sport of the day, but usually with the sound off so it isn’t obnoxious to those who enjoy their conversations. When in a Greek restaurant you should eat like Greeks, which usually means starting with a spread of appetizers and a shared main course. You have another option here though, their “big fat Greek feast.” This combination platter dinner is offered in a portion that is described as serving two to four for $45 or a larger portion that serves four to six for $75. 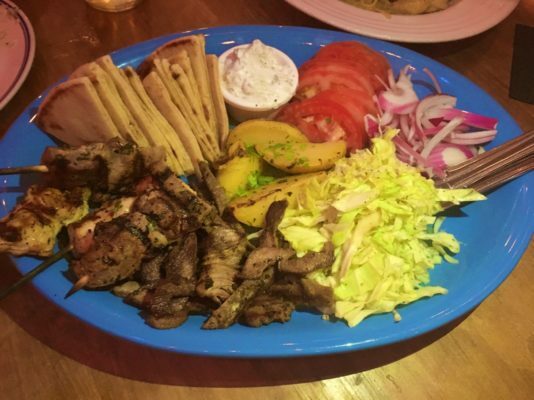 Both start with a traditional horiatiki village salad and flaming saganaki cheese appetizer, followed by a platter with skewers of pork and chicken souvlaki, roasted potatoes, and slices of gyro meat with red onions, tomatoes, cabbage salad, and pita bread. Also included, because it’s included with every meal, are small loaves of their crusty house-baked bread. The saganaki is a camera-ready appetizer. The hot kasseri cheese is doused with brandy and set afire as it arrives at the table. Then the flickering blue flames are extinguished with a squeeze of lemon. The brandy burns briefly and at low temperature so the cheese is heated rather than scorched, and partly melted and given a toasted crust rather than being burnt. The mild, slightly salty cheese goes well with the tart lemon, but it’s as much about the ceremony and show as the flavor. The Greek Village salad is an authentic version of a Greek salad, meaning a mix of vegetables and feta cheese without lettuce, which is an American addition. It’s all about simple flavors, and Jimmy’s somehow got some fairly flavorful tomatoes even out of season so it was particularly good. It will be better in summer when the tomatoes have had more heat to ripen, but that’s the case everywhere. This is followed by the photo-worthy big plate of everything else, which arrives with the potatoes in the center and everything else neatly arranged around them. The souvlaki, skewered meat marinated with oregano, garlic, and pepper, are less assertively peppery than the ones I remember having in Athens, but there is still a balance of grill char and spice along with the flavors of the meat. What is less common here are the gyros, which are the real Greek style. Gyros in California are usually made from a mix of lamb and beef that is a kind of compressed sausage, but Jimmy’s also offers them made with pork, which is most typical in Greece, or chicken. If you’ve had gyros in Greece, these will be as close as you can get to the experience. The pungent tzatziki sauce, a mix of yoghurt with garlic and dill, is great with the meat or a dip with toasted pita bread. The only other prepared items on the plate, the lahana cabbage salad and the roasted potatoes with oregano, are typical of the simplicity of Greek food. It’s that Mediterranean ideal of using olive oil, citrus, and herbs to subtly enhance the raw ingredients. As with many other items here that are deceptively simple, you might be moved to exclaim that you could do this at home. And so you could, but it wouldn’t turn out this well because you haven’t had this much practice at finding that balance. Having ordered the smaller of the two combination plates several times, I can say that it’s a very full meal for three or a light dinner for four. To top it up for a party of four you might also order a bowl of pasta or their eggplant parmesan, which is particularly well made here. If you go for the pasta, I suggest the Kai Brokolo, shrimp and broccoli sautéed in olive oil and then tossed with penne pasta, garlic butter, and lemon. The portion is substantial, and the seafood flavor adds a nice contrast to the other items on the combo plate. The selection of wines by the glass or half bottle includes retsina, the resin-flavored white wine which most Greeks enjoy and most others don’t. Our server Niko actually warned me about it when I ordered a half bottle of the Malamatina retsina to share and seemed relieved when told that we knew what we were doing. If you think of drinking a light, fresh wine from a cup made of fresh pine wood, you get an approximation of the effect. The Greeks started adding pine resin to wine as a preservative, but do it now just because they like it. If you do too, you are truly Greek at heart. Those who prefer a more conventional wine might pick the Assyrtico, a very good white that is slightly acidic and very floral, or the Nemea, whose label proclaims that it is from “The Land of Hercules.” This wine isn’t quite as strong as that mythological hero but has lots of fruit and oak with a little herbal flavor, and it’s excellent to complement red meats. Finish the meal with baklava or cannoli if you’re feeling traditional or a gelato if you aren’t, and a bracingly strong Greek coffee or two if you feel like staying awake for a long time. In a Greek village the meal would be followed by music, dancing, and brandy, but in the South Bay you’ll probably have to find other forms of entertainment. Jimmy’s still has the excellent pizzas and pastas that made them a destination for years, plus the specialties that set them apart. Whatever you decide on, the hospitality is as warm as the islands in the wine-dark sea.